Enjoy Juneau's most popular tour, and get up close and personal with Alaska's most famous ocean residents. 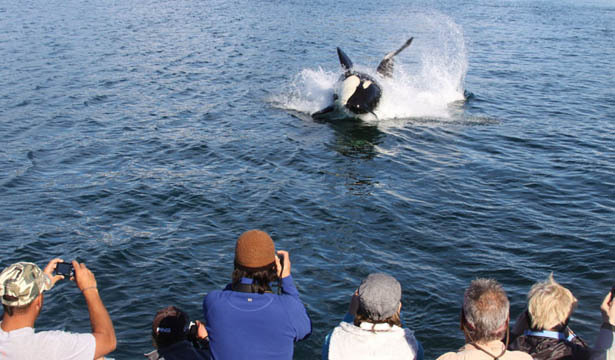 On these tours you are guarateed to see whales or you get your money back. Other commonly seen ocean wildlife includes sea lions, porpoises, seals, and otters; but make no mistake, the stars of the show are the humpback whales and orcas that live and breed in these icy waters. This is Juneau's "Do Not Miss" tour. Inquire about combining this tour with tours in Skagway and Ketchikan for additional savings. Tour is three hours, two of which are on the boat. Camera and jacket (warm layers) recommended. Cabins are heated, and a light snack is provided. Humpback whales are most commonly sighted, but we see many other animals on occasion, such as black bear and bald eagles. Sometimes, customers are thrilled to see humpbacks breach (jump from the water) or bubble feed. Indeed, every day is an adventure.